Medical anthropology is the fastest growing specialist area within anthropology, both in North America and in Europe. Beginning as an applied field serving public health specialists, medical anthropology now provides a significant forum for many of the most urgent debates in anthropology and the humanities. It includes the study of medical institutions and health care in a variety of rich and poor societies, the investigation of the cultural construction of illness, and the analysis of ideas about the body, birth, maturation, aging and death. Cambridge Studies in Medical Anthropology comprises theoretically innovative textbooks, monographs and state-of-the-art edited collections in this fast-growing specialist area. This book shows how practitioners in the emerging field of 'cultural epidemiology' describe human health, communicate with diverse audiences, and intervene to improve health and prevent disease. It uses textual and statistical portraits of disease to describe past and present collaborations between anthropology and epidemiology. 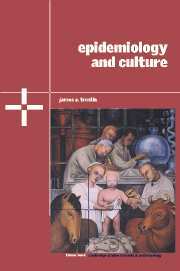 Interpreting epidemiology as a cultural practice helps to reveal the ways in which measurement, causal thinking, and intervention design are all influenced by belief, habit, and theories of power. By unpacking many common disease risks and epidemiologic categories, this book reveals unexamined assumptions and shows how sociocultural context influences measurement of disease. Examples include studies of epilepsy, cholera, mortality on the Titanic, breastfeeding, and adolescent smoking. The book describes methods as varied as observing individuals, measuring social networks, and compiling data from death certificates. It argues that effective public health interventions must work more often and better at the level of entire communities. Andrea Wiley investigates the ecological, historical, and socio-cultural factors that contribute to the peculiar pattern of infant mortality in Ladakh, a high-altitude region in the western Himalayas of India. Ladakhi newborns are extremely small at birth, smaller than those in other high-altitude populations, smaller still than those in sea level regions. Factors such as hypoxia, dietary patterns, the burden of women's work, gender, infectious diseases, seasonality, and use of local health resources all affect a newborn's birth weight and raise the likelihood of infant mortality. 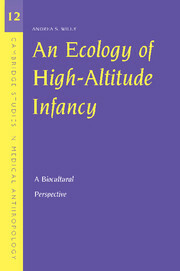 An Ecology of High-Altitude Infancy is unique in that it makes use of the methods of human biology but strongly emphasizes the ethnographic context that gives human biological measures their meaning. It is an example of a new genre of anthropological work: 'ethnographic human biology'. 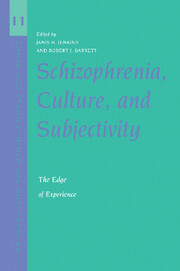 This volume brings together a number of the foremost scholars - anthropologists, psychiatrists, psychologists, and historians - studying schizophrenia, its subjective dimensions, and the cultural processes through which these are experienced. Based on research undertaken in Australia, Bangladesh, Borneo, Canada, Colombia, India, Indonesia, Nigeria, the United States and Zanzibar, it also incorporates a critical analysis of World Health Organization cross-cultural findings. Contributors share an interest in subjective and interpretive aspects of illness, but all work with a concept of schizophrenia that addresses its biological dimensions. The volume is of interest to scholars in the social and human sciences for the theoretical attention given to the relationship between culture and subjectivity. Multidisciplinary in design, it is written in a style accessible to a diverse readership, including undergraduate students. It is of practical relevance not only to psychiatrists, but also to all mental health professionals. Daniel Moerman presents an innovative and enlightening discussion of human reaction to the meaning of medical treatment. Traditionally, the effectiveness of medical treatments is attributed to specific elements, such as drugs or surgical procedures, but many things happen in medicine which simply cannot be accounted for in this way. 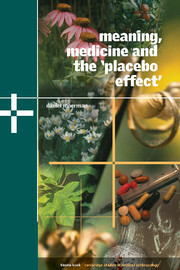 The same drug can work differently when presented in different colours; drugs with widely advertised names can work better than the same drug without the name; inert drugs (placebos, dummies) often have dramatic effects on people (the 'placebo effect'); and effects can vary hugely among different European countries where the 'same' medical condition is understood differently, or has different meanings. This is true for surgery as well as for internal medicine. This lively 2002 book reviews and analyses these matters in lucid, straightforward prose, guiding the reader through a very complex body of literature, leaving nothing unexplained but avoiding any over-simplification. This stimulating collection of essays is the product of face-to-face dialogues among anthropologists, sociologists, and philosopher-historians, all of whom focus their attention on the newly created biomedical technologies and their application in practice. 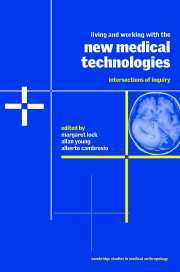 Drawing on ethnographic and historical case studies, the authors show how biomedical technologies are produced through the agencies of tools and techniques, scientists and doctors, funding bodies, patients, clients, and the public. Despite shared concerns, these essays reveal that the authors have achieved no consensus about the objectives of their research, and the deep epistemological divides clearly remain - making for provocative reading. 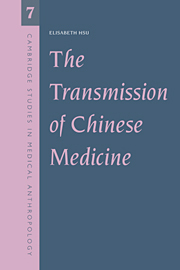 This is one of the first studies of traditional medical education in an Asian country. Conducting extensive fieldwork in Kunming, the capital of Yunnan Province in the People's Republic of China, Elisabeth Hsu became the disciple of, a Qigong master a scholarly private practitioner, who almost wordlessly conveys esoteric knowledge and techniques; attended seminars given by a senior Chinese doctor, an acupuncturist and masseur, who plunges his followers into the study of arcane medical classics, and studied with students at the Yunnan College of Traditional Chinese Medicine, where the standardised knowledge of official Chinese medicine is inculcated. Dr Hsu compares the theories and practices of these different Chinese medical traditions and shows how the same technical terms may take on different meanings in different contexts. This is a fascinating, insider's account of traditional medical practices, which brings out the way in which the context of instruction shapes knowledge. 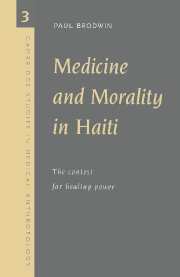 Morality and medicine are inextricably intertwined in rural Haiti, and both are shaped by the different local religious traditions, Christian and Vodoun, as well as by biomedical and folk medical practices. When people fall ill, they seek treatment not only from Western doctors but also from herbalists, religious healers and midwives. Dr Brodwin examines the situational logic, the pragmatic decisions, that guide people in making choices when they are faced with illness. He also explains the moral issues that arise in a society where suffering is associated with guilt, but where different, sometimes conflicting, ethical systems coexist. Moreover, he shows how in the crisis of illness people rework religious identities and are forced to address fundamental social and political problems.